Santo Domingo Blues is the fascinating tale of how Bachata, a music genre once vilified by the Latin upper class as the bawdy ghetto soundtrack of brothels and vulgar cabarets, came to rival meringue and salsa as the preferred music of the Latin world. Through performances, first-person interviews and telling verite scenes with guitarist and guitarist and singer/songwriter Luis Vargas – and his fellow bachateros, viewers are treated to not only a bittersweet success story on one immigrant artist, but an understanding of this once-maligned music style. 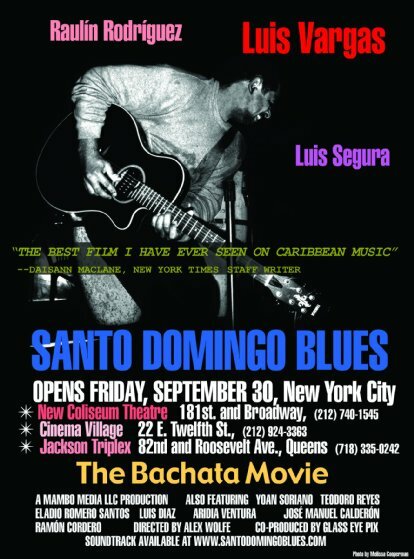 Following Vargas’ poignant journey from New York City back to his hometown of Santa Maria in the Dominican Republic, award-winning director and producer Alex Wolfe tells the story of Bachata’s transformation from a “song of bitterness” to an emblem of Dominican national pride.